I have a question. Do you regularly pray for your spouse? If not, why not? Think of it. Your spouse, next to God, should be the most important person in your life—more than children, parents, or anyone else. You are connected to that man or woman and to pray for them is the ultimate expression of your love for them. You should be praying for their salvation—if they do not know the Lord. And if you do not know the Lord, give yourself over to Him totally—you will never regret it! Afterwards, you should be praying for their growth in God, their health and progression in life. To pray for your spouse is to say: you and your relationship with God mean more to me than just my needs and what you can do for me. If praying for your spouse is not a regular thing for you, there is no time like the present to start. The verse above is a good place to start. Try praying those things for your spouse this week and see the Word of God work in their life and ultimately in your marriage. Have a wonderful Marriage Monday! Very nice. I pray for him all day, every day as I am Standing for the restoration of my marriage (we’re divorced) instructed by God to do so. You’re welcome Tamara! I will stand with you in your prayers of restoration…Blessings! Thank You! I will take all the prayers I can! To stand is often standing alone. Well you have it! Expect results! Feel free to contact me via email if necessary. Blessings! You’re so welcome! Thank you for your reply to this post! When we keep our hearts connected to God and allow Him to love our spouses through us in prayer, it will have a profound impact on our lives, our spouses, our family’s and our world! Blessings to you both! Oh Pastor Sebastian what you say is so true! God should anchor every marriage. As a counselor I have seen so many families deteriorate due to the wife wrapping her whole world around her children instead of her husband’s need for fellowship and companionship. (Laughing!) Of course I will pray! I am linking my faith with yours that the Lord’s Will be done in your lives. Your submission is encouraging. Far too many are in an unfortunate state of resistance. The power of praying with and for your spouse cannot be overstated. 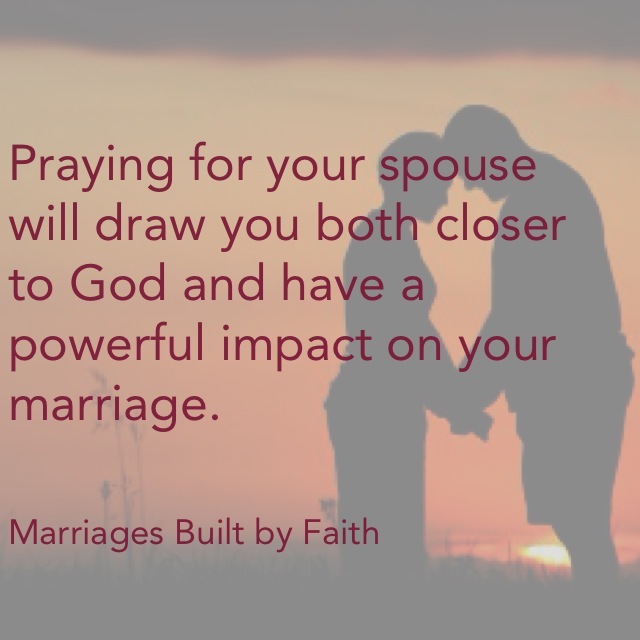 In marriage, we have a built-in prayer partner. I believe God designed it this way…two hearts joined together, united and cemented by Him! If the Church would major on this, our experiences would be revolutionized! You’re certainly welcome Ellie! Please know the feeling is mutual indeed. You have been a wonderful encourager to me and my ministry! Although you and hubby are in ministry yourselves, how I wish I could pastor a few couples like yourselves. That’s not saying anything negative about those to whom I minister personally, but there is nothing wrong with adding a few more ‘diamonds’ to the set! Love you and praying God’s best for you both!